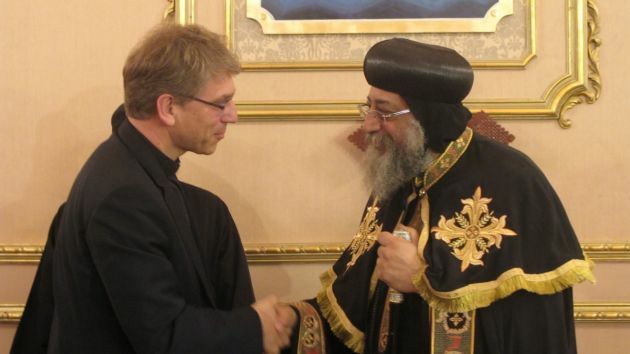 WCC general secretary, Rev.Olav Fykse Tveit, met Pope Tawadros II, Patriarch of the Coptic Orthodox Church, Sunday at St. Mark's Cathedral, Cario, site of attacks two weeks ago following a funeral for Christians killed in a northern Egyptian town only a few days earlier. During his meeting with Tveit, Tawadros noted, "Egypt is inherently moderate. It is natural as we all drink from the same river of Nile." In a WCC statement Tawadros was quoted saying that "Amidst difficulties that the Coptic Church in Egypt faced in history, it is faith which has sustained Christians and their strength." It is due to this strength, he said, that they will continue to work for peaceful co-existence among all religious communities in Egypt. On April 9, Tveit condemned the attacks against St. Mark's Cathedral in Cairo and the killings of Christians in the village of Al-Khosous in Egypt. 'The sectarian conflicts and increasing tensions are a threat to the national security of the country and, above all, to Christian-Muslim coexistence in Egypt," Tveit said in his April 9 statement while pleading for sectarian peace. Christians, mainly Coptics constitute around 10 percent of Egypt's 85-million population, while Muslims, mostly Sunnis account for the rest of those in the country . Tawadros stressed that "Churches have to be a witness in Christ through blood, sweat and tears and work together with their Muslim brothers to address the trend of migration among Christians in Egypt." Tveit said, "We pray with you for justice and peace in your country. The dignity and welfare of all citizens in post-revolution Egypt is a shared hope of the global church. "We hear the experiences of Egyptian churches, and we have a great belief in the leadership of His Holiness Pope Tawadros to further dialogue between Christians and Muslims seeking peace and democracy." Tveit said the theme of the upcoming meeting of the WCC's highest governing body, its assembly, "God of life, lead us to justice and peace," is significant for the Egyptian churches, where Christians aspire to build a common future with peaceful co-existence among all communities. The assembly for the world church body that represents more than 500 million mainly Protestant, Orthodox and Anglican Christians that takes place every seven years and will be held in Busan, South Korea, from 30 October to 8 November this year. During the Cario meeting, Tveit introduced an upcoming WCC conference on "Christian Presence in the Middle East" to be held from May 21 to 25 in Beirut, Lebanon, gathering representatives of the Middle Eastern churches and ecumenical organizations. While in Cairo, Tveit also visited the office of the Bishopric of Public, Ecumenical and Social Services (BLESS), a development wing of the Coptic church, where he learned about its projects in rural communities on issues of poverty, female genital mutilation and HIV and AIDS. Tveit met with several representatives of the Coptic church and ecumenical organizations, including Bishop Anba Youannes, Dr. Salwa Morcos, Metropolitan Bishoy of Damiette and Fr. Beshouy Abdelmalek, general secretary of the newly established Egyptian Council of Churches (ECC). Tveit congratulated the national council, saying that creation of the ECC is a "sign of hope and faith for churches in Egypt working together in unity and being witnesses of Christ in difficult times."